Regler are the reductionist duo of drummer Anders Bryngelsson and guitarist Mattin. The last time we met on these pages I had failed to see how a release of theirs containing little but silence was anything other than a waste of plastic, card and valuable drinking time. The release in question was their interpretation of a Fluxus like instruction to set up their equipment before going to sleep under the powerful glare of an industrial lamp. Being upstanding gentlemen Bryngelsson and Mattin got in touch to say that they were absolutely positive that if they sent me another expression of their work I would definitely, honest to God like it, double promise, fingers crossed with a cherry on top. Which is an attitude I admire in a person [or persons]. If only more people had such guts and were willing to give someone a second chance. So I said yeah go on then, send me something else. So they did and thus ‘Regel #8 [metal]’. A 'Metal' inspired release and there's me and 'Metal' being about as close as Donald Trump and the Brighton LGBT community. The omens weren't good. I gave up on Heavy Metal after I realising the genre wasn't much more than the diminishing returns of Black Sabbath’s back catalogue. Its fans did nothing for me either; leather wristbands, t-shirts with unreadable band names, the undying devotion to the sound of an amplified electric guitar riff and they are like sooooo alternative man, like real outsiders, like we have upside down crosses and drink goats blood out of skulls and can listen to the loudest music ever and nobody likes Metal more than me. Once ‘Metal’ had morphed into bands playing nothing but the same chord for an hour I knew that the lunatics had taken over and that it was only a matter of time before we’d gone full circle and the kids were buying reissued Blue Cheer albums and scribbling band names on to the backs of their cut off denim jackets. 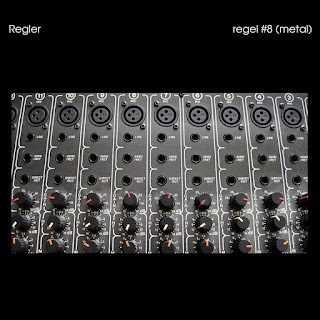 Regel #8 [Metal] contains three live tracks as recorded on a short tour at the back end of 2015, in which Regler asked the audience to play Metal tracks of varying genres through their personal devices [mobile phone, tablet, ghetto blaster the size of a suitcase, wind up gramophone housed in a Victorian bassinet] which Regler then improvised over with someone mixing the results into what we have here; ‘Heavy Metal’, 'Thrash Metal’ and ‘Black Metal’. What happens next depends on how keen you are on 'Metal', music of an experimental nature and the mixing of the two. I get the feeling that Metal diehards may find Regler's work hard to digest seeing as how this is Metal in a hard to recognise form, shorn of structure, lyrics, recognisable riffs or eye squeezing solos. Seeing as how I’m leaning more towards the experimental side of things I did find myself coming away from the ensuing melee with an appreciative nod which on more liquid days could have turned in to a headbang. Especially during the last track ‘Black Metal’ which is basically half an hours worth of chugging drum pummel with everything from noise, disjointed riffs and those growly vocals so beloved of Norwegian church burners chucked in along its length. 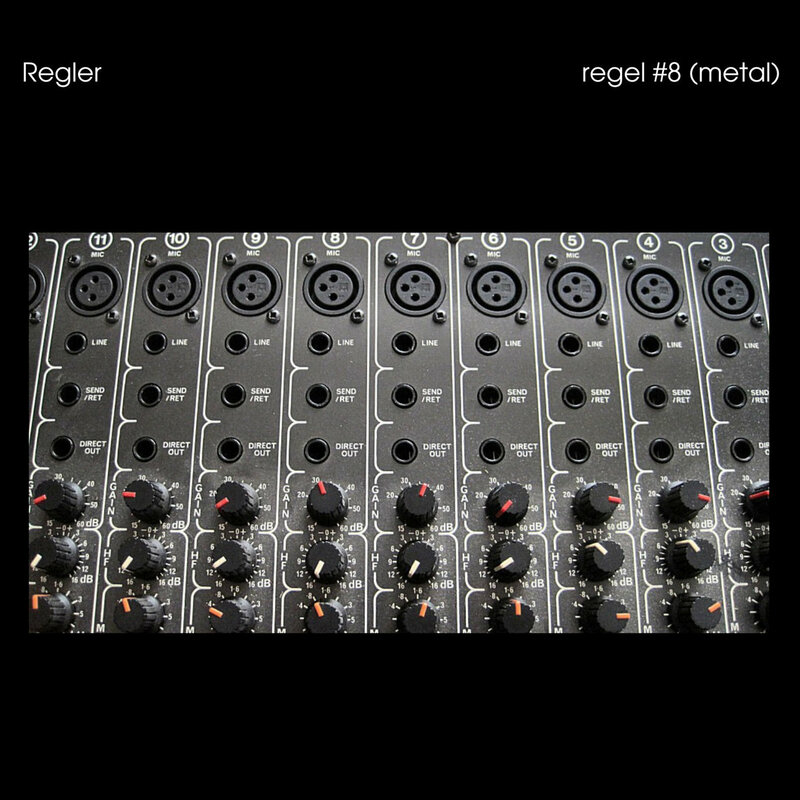 The way Regler and the mixer [in this instance Ivan Kocev] have transformed Black Metal by basically buggering about with it makes it more than listenable for me. A result of sorts. If I’d have been at the gig in Skopje I dare say I’d have hooked my thumbs in to my belt loops and swung my head from side to side in a no nonsense head down mindless boogie kind of way. Its what they would have wanted. 'Heavy Metal’ was mixed by Andy Bolus at a gig in Paris and is in the more traditional groove with an intro that just keeps on keeping on. ‘Thrash Metal’ at 25 minutes is a disjointed affair with bits of Thrash coming at you in rapid two and three second bursts, all this with high pitched squeals and random bursts of guitar noise and as such gets a Ceaser like non committal wavering sideways thumb gesture. Still, the omens are good. There’s enough here to convince me that 'Metal' is ripe for experimentation and by that I don’t mean de-tuning your Les Paul a semitone and going ‘thrummmm’ for an hour.